My Christmas Day Honey Oatmeal Bread was delicious! After I sent a loaf home with The Pretty One I was left with half a loaf. I rarely eat sandwiches but wasn’t going to waste all that goodness. So what to do with my leftovers? If you’re lucky enough to have any, I’ve got a couple of ideas you might enjoy. 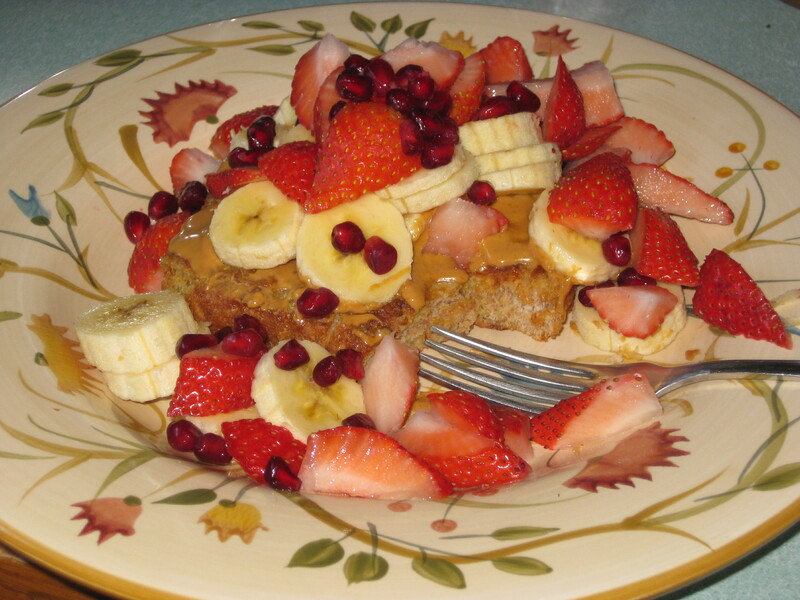 Honey Oatmeal Wheat Germ French Toast hides under peanut butter & fresh fruit. When it was perfectly toasted, I spread it with peanut butter, my favorite French Toast topping. I like how the saltiness of the peanut butter complements the sweetness of the cinnamon. Most of the time I eat pb&j on my French Toast, but having just purchased a variety of fresh fruit, I was excited to use that. I made a layered delight of French Toast, peanut butter, sliced banana, fresh strawberries, pomegranate seeds, and chia seeds (oops – not in the photo!). Was it good? Oh, yeah! Will I make it again? Definitely!! Ha! Should have taken a picture before I ate half the croutons! After making French Toast I still had part of a loaf left. I like big, fat croutons on my salads, but those are hard to come by in the stores. Besides, homemade is better, right? I cut the bread into chunks, tossed it with a little oil, sprinkled on some sea salt, and popped them into the oven. Oh, the smell! I couldn’t wait to put those on my spinach salad! The combination of the sweet bread and light sprinkling of sea salt was delicious! In fact, I liked it so much I kept eating the croutons straight out of the pan. 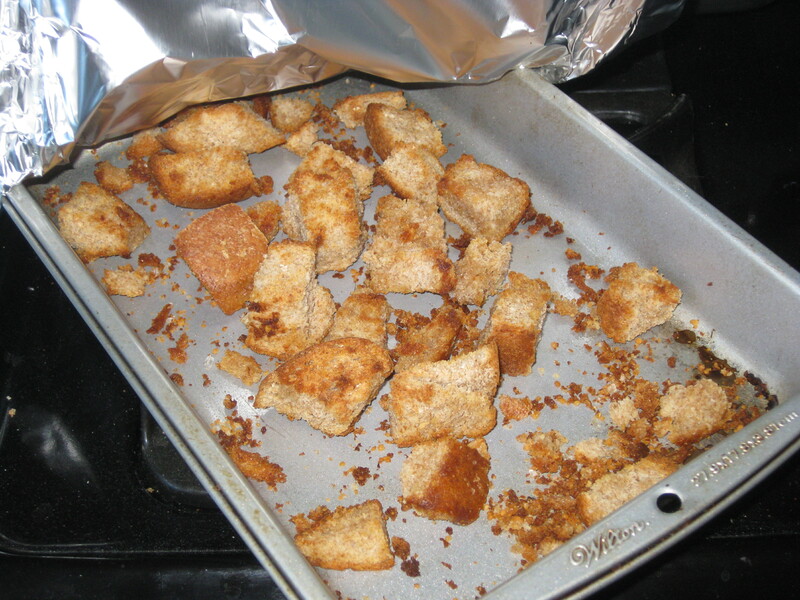 Looks like I need to make some more bread so I can have more croutons! Maybe I’ll try some rye bread next.